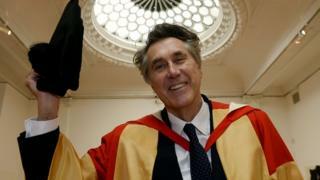 Image caption Bryan Ferry described studying in Newcastle during the 1960s as "inspiring"
Bryan Ferry has received an honorary degree from Newcastle University where he studied in the 1960s. The 69-year-old was made an honorary doctor of music. He graduated in fine art from the university in 1968 before going on to star in Roxy Music, one of the most acclaimed glam rock bands of the 1970s. Before the ceremony earlier, he said: "Music and art have guided my life, and it all started at Newcastle University." Formed in 1971, the group recorded albums such as For Your Pleasure and Avalon before Ferry went on to achieve further success as a solo performer. Known for his sartorial elegance, he was dressed in a dark suit and blue spotted tie with a red and gold gown over the top as he collected the degree. Ferry, who was born in Washington, Tyne & Wear, said: "I feel honoured to have been awarded this doctorate from my former university. "It was an inspiring time to be an art student in Newcastle, and the city also had an exciting music scene." On Thursday, Ferry's Roxy Music band-mate, saxophonist Andy Mackay, was honoured with an Alumnus of the Year award by the University of Reading.